Bio: Cheryl Culver studied Fine Art at Leicester College of Art & Design. After graduating she spent 18 months in Mauritius with the International Voluntary Service as an artist. On her return to England she established a partnership working in property renovation and interior design using her skills to produce the architectural drawings and artists impressions of projects undertaken. Cheryl lives in Sandwich where she has a custom-built studio in her garden. Quiet unspoilt places are her inspiration and she shares these with her English Setter and her sketch book. She has featured regularly in the Artists Magazine, in December 2008 in the Pastel Journal, and Pratique des Arts feature article October 2010. 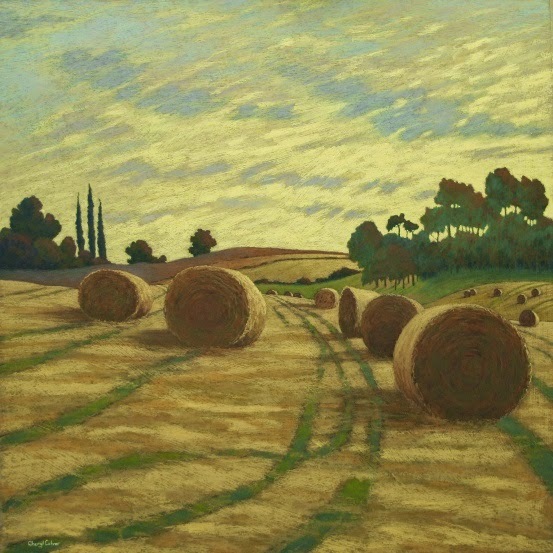 Cheryl Culver has exhibited at the Mall Galleries with the Royal Society of British Artists and the Pastel Society UK since 2001. In June 2003 she was elected as a member of the Royal Society of British Artists and in March 2004 was elected a member of the Pastel Society UK. In July 2012 she was elected as President of the Pastel Society UK. She was a guest of the French Pastel en Périgord Society in 2012, where she was presented with the Pastels Girault award. Navigation: Main menu remains available on top of page.